Popularly called impenetrable, all year round trackers lead groups of tourists into this beautiful jungle forest in search of the rare and endangered mountain gorillas. Coming face to face with nature's reflection of mankind, is an emotional experience of a lifetime. Bwindi national park is home to nearly half of the world's mountain gorillas with an estimated number of 480 gorillas. The rest of the gorilla population is located in the Virunga conservation region which occupies 3 countries of Rwanda, Democratic Republic of Congo and Uganda. All visitors with reservation of gorilla permits booked for that date assemble at the park by 07:30 am for general briefing and safety information. There are 104 gorilla permits available daily and a maximum of 104 people who can take park in a gorilla safaris on a single day in Bwindi forest. A single sector of Bwindi forest can accommodate about 20 to 40 people daily. They are broken into smaller groups with a maximum of 8 people to track one of the 13 habituated gorilla families that live in Bwindi impenetrable national park. The guides, trackers, armed guards (to reassure your security) and porters lead visitors to find the gorillas in the impenetrable forest. Treks can take less than an hour or several hours depending on the day and the gorilla family. The slopes are steep and the bushes, trees and vines are thick, but the trek is worth the effort! All guides are helpful, very knowledgeable about the park and ready to share gorilla tales. Gorilla groups in Uganda usually comprise of about 6 - 30 members of varying ages, sizes and babies. They are similar to humans with a dominant alpha male silverback gorilla heading the family. The time spent trekking gorillas is difficult to tell, but if you are tracking a distant gorilla family, expect to take longer hiking to find the gorillas. In case a visitor needs a nearby group, you can talk to the guides as they have an idea of the locations of each group. · Have some fitness and be prepared to hike up and down. · Pack Water resistant hiking pants especially if travelling in the rainy season otherwise any type of long pants will do. · Long sleeved cotton t-shirt. · Good hiking boots are a must - especially during the rainy seasons. The dry seasons are not slippery and hiking is easy. · Bring high/tall socks to tuck your pants. · Garden gloves come handy as they protect your hands from thorns and nestles. · Have a packed lunch in your back pack. The trek can become longer than expected. · Carry lots of mineral water - at least 3 liters. · Hire porters for $15-20 US equivalent. Convert to Ugandan shillings as porters have no means of getting US $$$ exchanged. If you carry $$, they should be current notes of over 2013 and in good condition. · Hiking sticks are provided at the briefing point, please take one or two as they help you balance during the hike. · A light rain jacket is a must. · A bug spray or insect repellent. Uganda gorilla permits are sold at $600 all year round as the low season discount was scrapped. The cheapest option for gorilla trekking is Democratic republic for Congo with gorilla permits sold at $400 while gorilla permits in Rwanda go for $1500. Today many visitors are opting for Congo's Virunga national park because of her low gorilla permit offer. Gorilla tracking in Congo is just as breathtaking as Uganda or Rwanda since they are located in the same geographical location. In the low seasons, Congo's permits go as low as $200. A big concern for many tourists looking to explore Congo is the security. Checkout recent trip advisor reviews from tourists recently from Congo so you find some assurance on security. To reduce on gorilla tour costs, tourists can book through local tour operators on ground as they are much cheaper and yet you get to support the locals. With a tour operator, you pay for a comprehensive tour package which includes the package, accommodation, vehicle, local guide. Alternatively, tourists can easily book gorilla permits via government tourism bodies in charge of selling gorilla permits. The most convenient way to acquire a gorilla permit is booking your tour via a local tour operator. Ordinarily, your package includes pickup and drop off, permits, water, accommodation, transportation and food. You can also plan your tour yourself and take time to book all the logistics yourself - A lot of work but achievable. You can hire your own vehicle, or use public bus to Kabale and hire a vehicle to Bwindi national park. You must have purchased your gorilla permit before getting off for Uganda or Rwanda. Don't go to the park without your permit because you will not get one there! All spots have been booked, especially during the peak seasons. You can take the chance during the low seasons as some groups may still be available - but it’s a gamble. You can contact the Uganda Wildlife Authority (UWA) in advance and confirm purchase of your gorilla permit. Even if you will be coming in from Rwanda, you can organize with the office to send your permit to you without a problem! 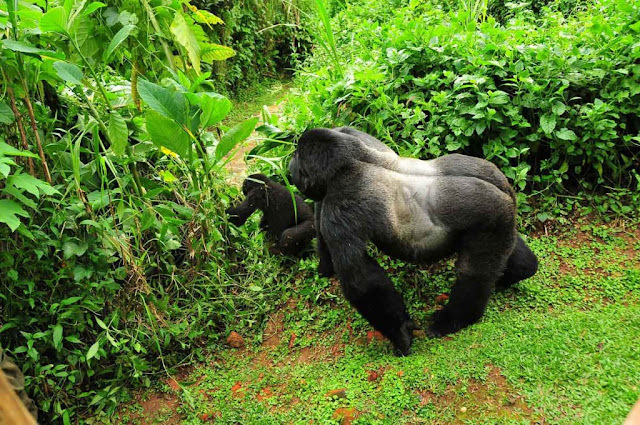 Many tourists are very hesitant to trek gorillas from the Mgahinga national park and prefer trekking in Bwindi forest. Yes Bwindi forest offers more gorilla group options than Mgahinga which has just one family. Mgahinga national park offers a single large gorilla family with many gorillas! Since it’s less visited, trackers who choose this national park enjoy a special gorilla watching experience as it’s less crowded, offering you superb views. Book a flight now to Uganda by searching for the cheapest airfare at Traveloka.